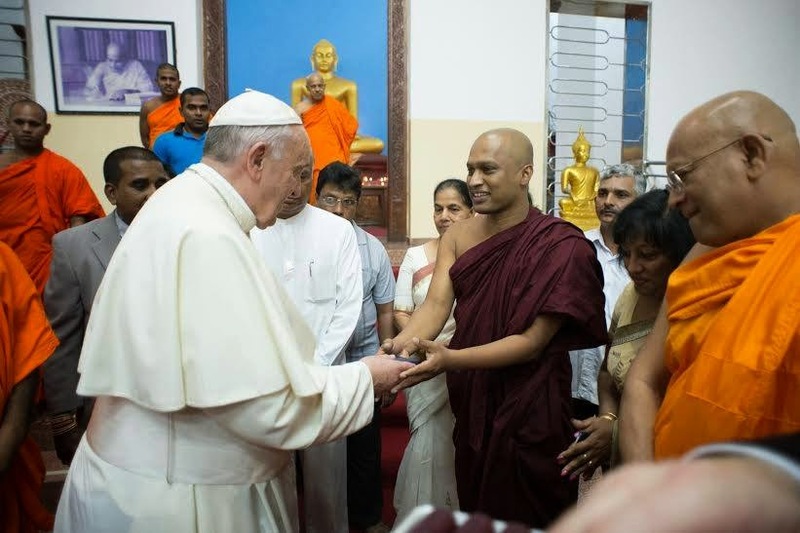 On arriving his first day in Sri Lanka, Francis sat down to an inter-religious dialogue. At this meeting he donned a uttariya shawl which was a gift from Sri Lankan Hindu priest Kurukkal SivaSri T Mahadeva. 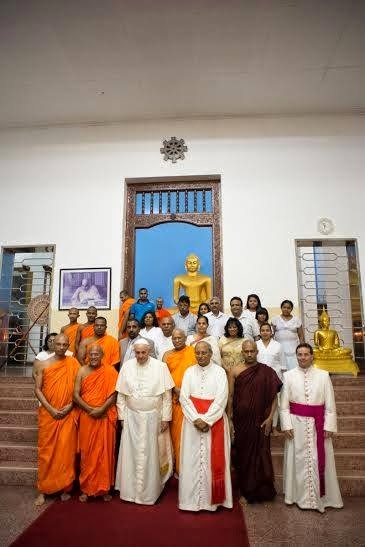 "The unscheduled stop, which the Vatican spokesman said lasted roughly 20 minutes, came after Francis had returned from an excursion earlier on Wednesday to a Marian sanctuary in northern Sri Lanka..."
Francis in the Mahabodhi Biharaya Buddhist temple. 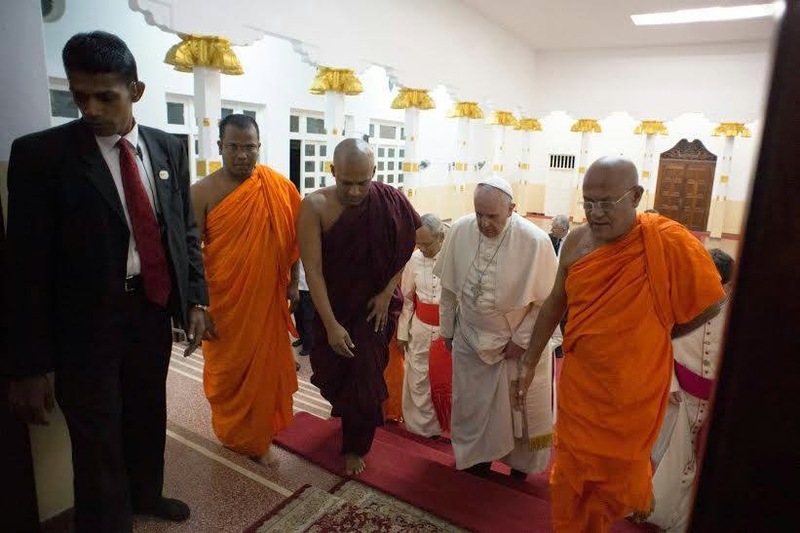 "While there, according to a Vatican spokesman, Francis was shown a room with a statue of the Buddha and two other holy figures in Buddhist tradition. His hosts also showed him a jar containing relics that are only opened occasionally, but which they opened for him. 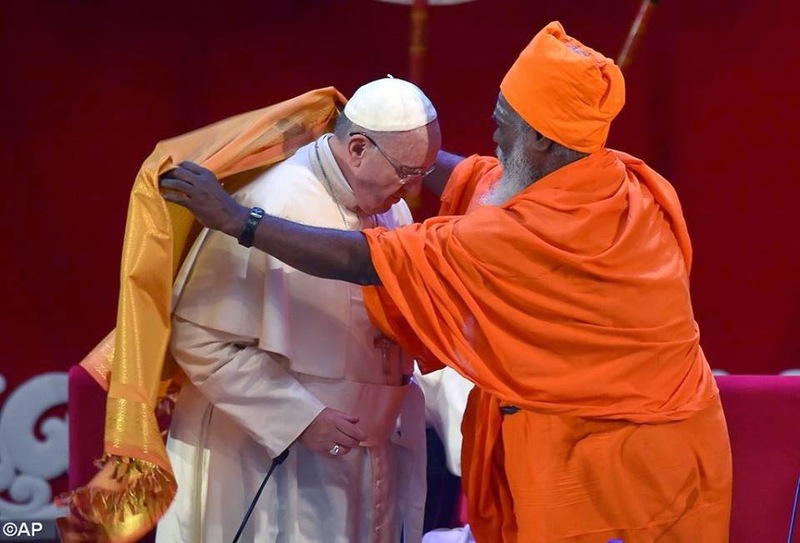 While not an absolute first, given that Pope John Paul II called upon a Thai Buddhist leader named Vasana Tara in a Buddhist center during a visit to Bangkok in 1984, Francis’ stop was certainly unusual." 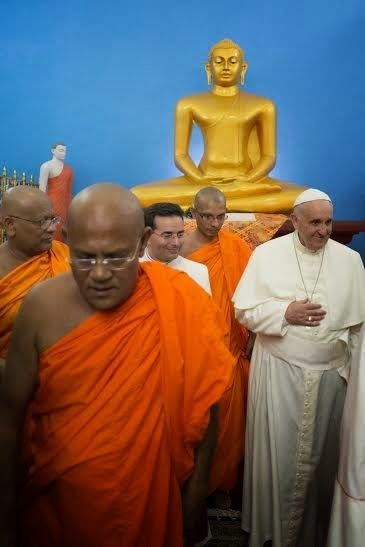 We are not aware of any official photos of the opening of the Buddhist relics during Francis' visit. 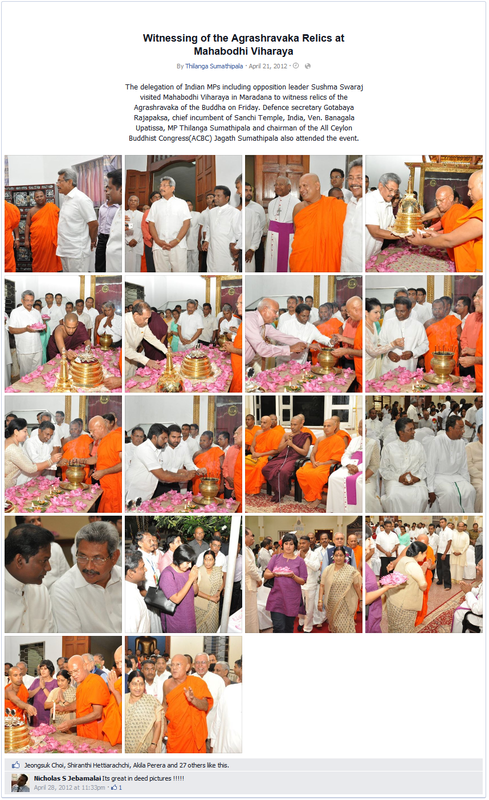 These photos archived on google are of the opening of these same relics in 2012. "The Vatican spokesman said Francis didn’t pray or meditate at the temple, but rather listened respectfully as the monks sang and prayed when they opened the stupa containing important Buddhist relics." Francis making new friends at the Mahabodhi Biharaya Buddhist temple. "Lombardi said the Pope took of his shoes before entering the temple, and inside the monks showed him the relics of two holy men kept in a stoupa, who were close to the Buddha, and sang a prayer. Normally the stoupa is only opened once a year, but they made an exception for the Pope. This was a sign of his intent to foster as far as possible the dialogue with other religions, according to Lombardi. John Paul II also entered a temple in Thailand in 1994." What a great example of Benedict XVI's hermeneutic of continuity in action! Is that a funeral face on Francis? The road to perdition is paved with inter-religious dialogue and syncretism! Francis and a skinny looking Buddha. See 45 seconds for his visit. Thank God he is not bringing a statue of Buddha back to Rome to place on the Tabernacle . The second reply by Anonymous seems to be a rant about Fr. Frank Pavone. Why is it posted here? The comment's final statement is WRONG that the tee shirts "seem to say (1) Abortion NEVER EVIL" and (2) "I Survived Roe vs Wade Survive Me"
Is there a link to subscribe to your blog? I wasn't able to find one. We added a follow by email box. We hope this is the same as subscribe. We apologize for not understanding the ins-and-outs of blogger. And he didn't hide his pectoral cross?